Warm, lightweight and super insulating for all season use. This advanced insulating layer offers outstanding warmth and is suitable for a range of activities. Our products use the latest technologies to ensure superior insulating properties for the wearer whatever the season. 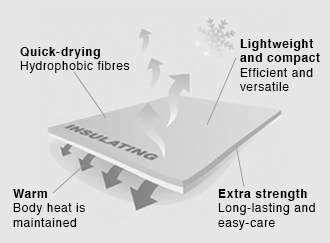 Our insulating products provide essential insulation for a range of activities and weather conditions. Ensuring that vital body heat is retained for extra warmth while being lightweight.